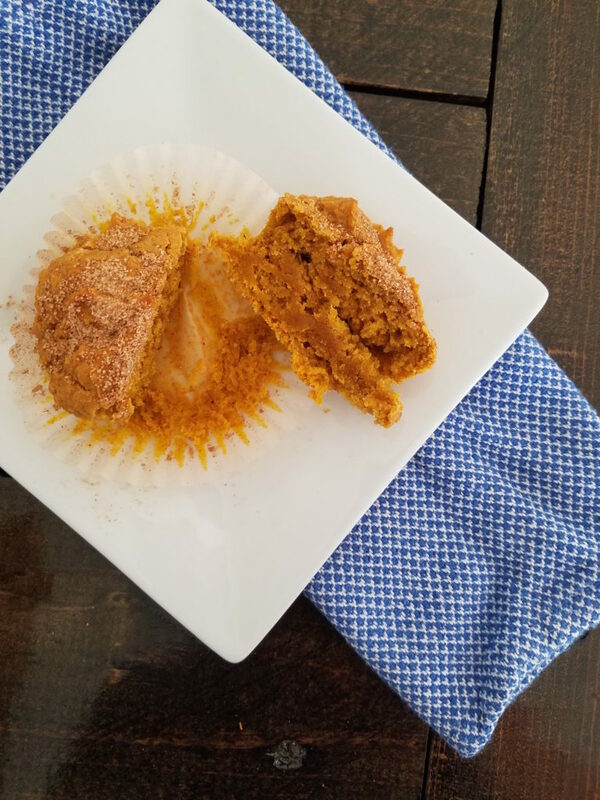 For now, I wanted to share a no-bake sweet treat. They seem like a dessert, but they really offer some great nutrition. Oats give a great source of fiber and make you feel much fuller longer. The addition of the bananas give the bites the added sweetness they need without any extra sugar, plus hey who doesn’t love potassium. Peanut butter can easily be substituted with almond butter which packs in the protein. The chocolate chips… why not? 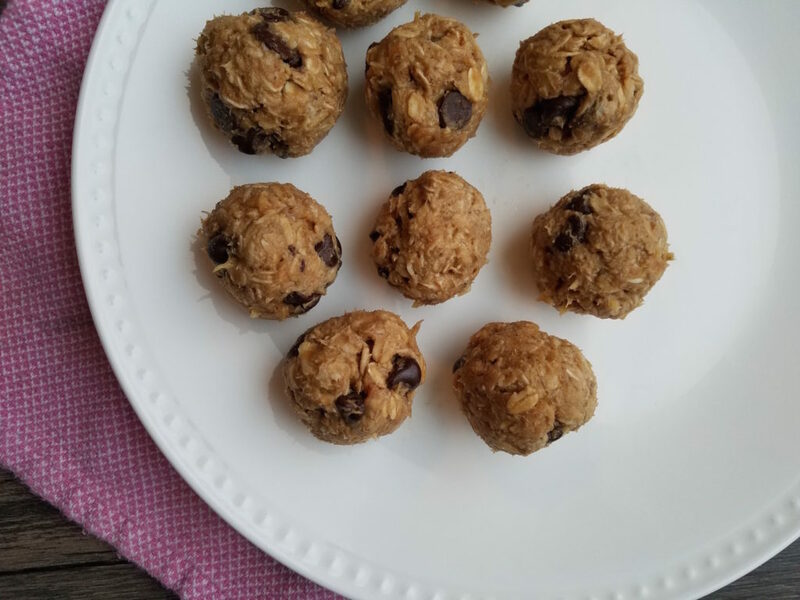 Grab one or two with your morning coffee for a quick on-the-go breakfast or have between meals to keep you full and avoid the bad snacks we sometimes lean towards. I hope to experiment with more variations and share any good ones I come up with here! 2. 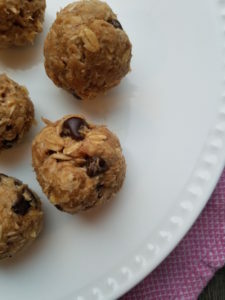 Add the oats, peanut butter, and chocolate chips. Stir until thoroughly combined. 5. Roll into balls and serve chilled or store in tight container in the fridge for about 3 days. I can’t believe Not So Doughie has been out of commission for the past 2.5 years! 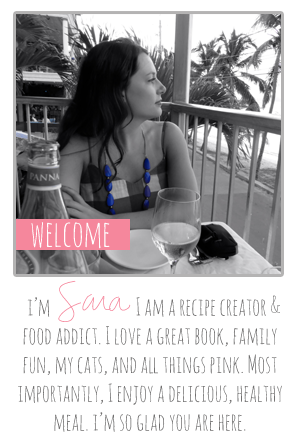 However, I am back and excited to share some new recipes. Over the years, I’ve received several requests to bring the blog back to life, which was great to hear. Blogging takes a lot of time & work that’s for sure, but I definitely enjoyed and missed it! I decided Not So Doughie will be my place to of course share healthier recipe, but I don’t plan to ensure I have the most perfect picture to share to increase “likes”, get more traffic, etc etc… Let’s be serious there are millions of blogs out there so becoming the next Pioneer Woman just isn’t my plan. So without further ado, I welcome you back and look forward to seeing your comments & sharing some Not So Doughie meals! September 1st rolls around and PUMPKIN is everywhere. Personally, I think people need to pump (<– pun intended) the brakes on this obsession. I mean, people obsess over a gourd…. Don’t get me wrong, I love the flavor pumpkin and am happy to enjoy a delicious slice of pumpkin bread and the occasional PSL. That being said, I decided the other day to try to concoct a healthier, Not So Doughie, pumpkin muffin. After watching What the Health (many opinions on this documentary), I became a little intrigued with a plant-based diet. 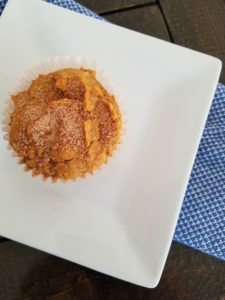 So when researching different muffin ideas, I decided to put together some of my findings on substitutions to create these Vegan Pumpkin Muffins. I was a bit skeptical at first because I love butter and just didn’t want them to come out dry and dense. 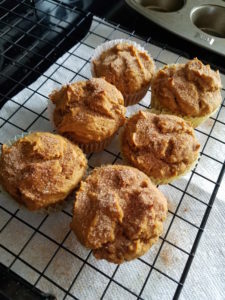 However, they are perfectly pumpkin-y, cinnamon-y, fall-y and delicious! I hope you enjoy! 1. Preheat oven to 350. Line muffin tins with liners. 2. In a large bowl, combine all the dry ingredients except for the sugar. 3. In a separate bowl, combine the syrup, pumpkin & oil. Throughly mix. 4. Gently fold the wet ingredients into the dry. Stirring until combined and smooth. 5. Pour into muffin liners, evenly distributing the batter. Smooth the tops. 6. Bake for 25-30 minutes. Use a toothpick to ensure thoroughly cooked (it will come out clean). 7. In a small bowl, combine the pinch of cinnamon and sugar. 8. As soon as the muffins come out of the over, sprinkle cinnamon sugar mixture over them. 9. 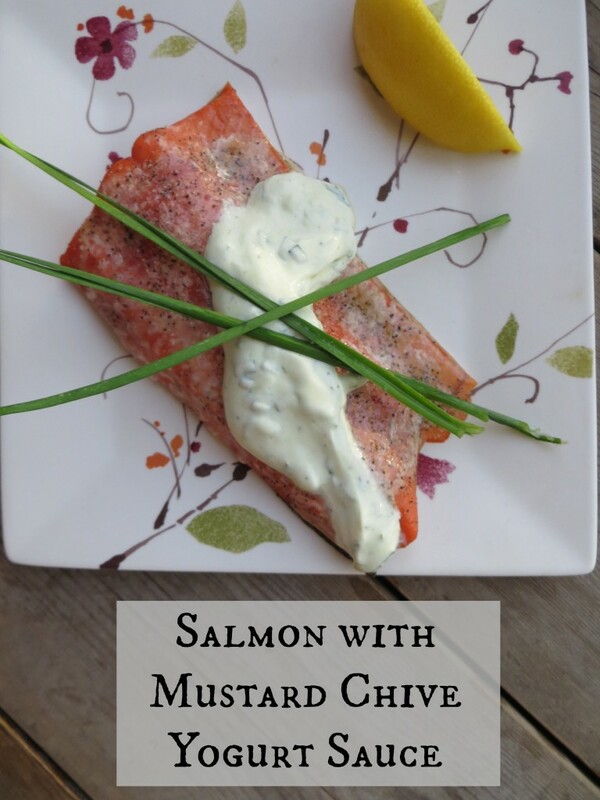 Serve immediately or store 3-4 days in airtight container. August 1st. Wow, is it just me or has this year flown by? I honestly cannot believe it is already August. That being said, summer is in its last month & before I know it Bryan, Chase and I will be heading out to the apple orchard for our annual fall trip. Then we will be bundled up trudging through the snow to go pick out the perfect Christmas tree. But just not quite yet…. There are far too many summer days to soak up & recipes to create. Has anyone tried to freeze corn on the cob before? I see them at the grocery store, but am thinking about trying it out so I have some of this amazing summer sweet corn for the winter. 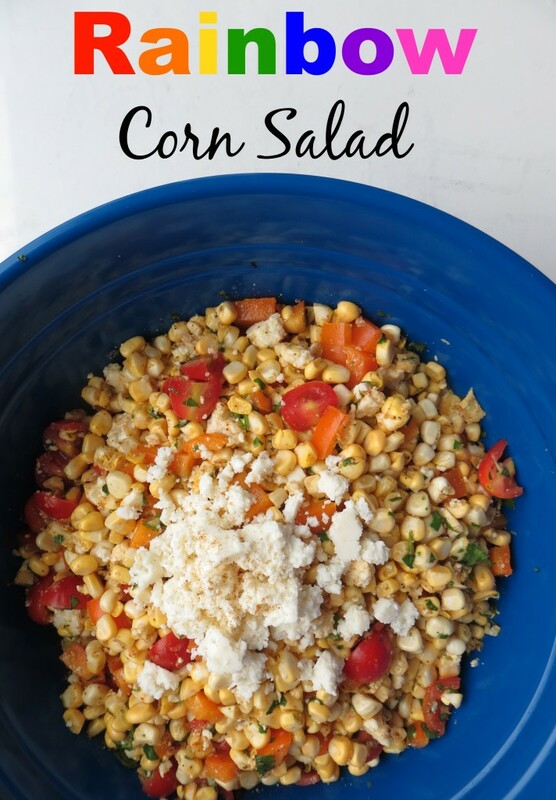 This summer corn has appeared in several of my recipes and oftentimes is our side dish. Not only are they so easy to make, but there are so many ways to cook (or not) them. 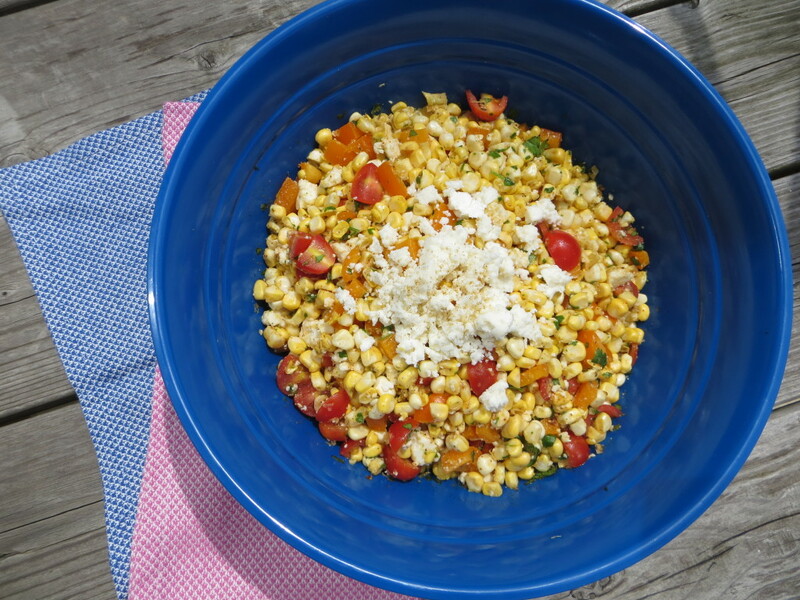 I grilled the corn, which I used in the Kale & Corn Salad I posted on Paige’s site. 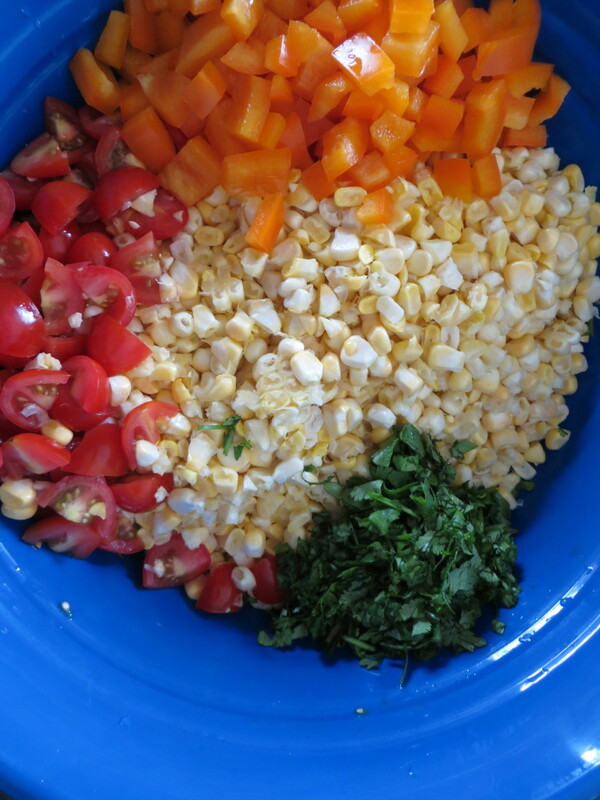 I also added them to my summer Shrimp & Corn Chowder. For this recipe, I left the kernels as is, straight up raw off the cob. Originally, I made this salad for my sister & her husband’s going away party. If I do say so myself, it was a pretty decent hit. I whipped it up for one of my girlfriend’s bachelorette parties…again a successful dish. It also makes for some great leftovers. All of the flavors meld together & become bolder as they sit. Another added bonus, the beautiful colors. I used literally every color of the rainbow.. ok I didn’t use blue so I made sure to use a blue bowl for serving. This dish is definitely eye-catching & I loved photographing it! 1. Remove the kernels from their cobs by placing a coffee cup upside-down in a large bowl. Hold the cob vertically, using the base of the coffee mug as its platform. Use your knife to slice down the cob. The kernels will fall into the bowl. 2. Add all other ingredients, except about 1 oz. of the cheese. Stir together. 3. Chill in the fridge until ready to serve & top with remaining cheese. It’s been over a week since I logged into this bad boy. I didn’t really have an agenda for this week’s menu and as you know if you have been following along for awhile, I tend to come and go from my blog from time to time. There are 3 recipes that I have been dying to share so I want to take the time to get back at it. Sometimes, life just gets in the way. There has been a ton going on at work, some great things actually, that have required my undivided-extra-time-in-the-office-outside-of-work attention. Possibly more on that to come at a later date. Anyways enough of that mumbo jumbo and onto this post because it does not disappoint! I get a lot of food magazines and I never will stop getting the actual magazine. I have gotten one on my Nook before, but I love tearing the magazine articles out and stashing them in my “to make” binder. This binder has been around for quite some time so if you have lived with me before you’ve probably seen it. 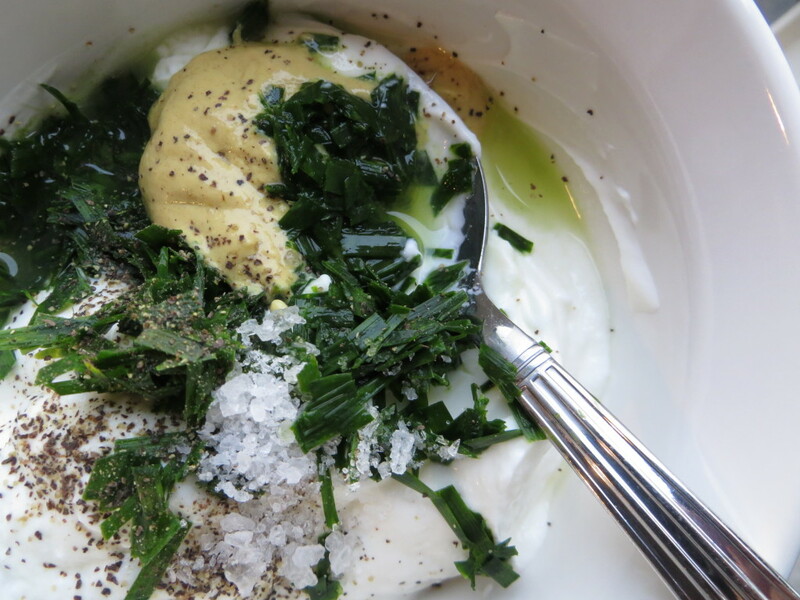 I use these clippings as blog inspiration and that’s where this post comes into play. The binder is expanding each week and so I been making a good effort to try out all the recipes I saved. If you follow me on Instagram you probably saw my post a few weeks ago of the picture of the shrimp tostadas. My binder is organized (somewhat) according to genre. 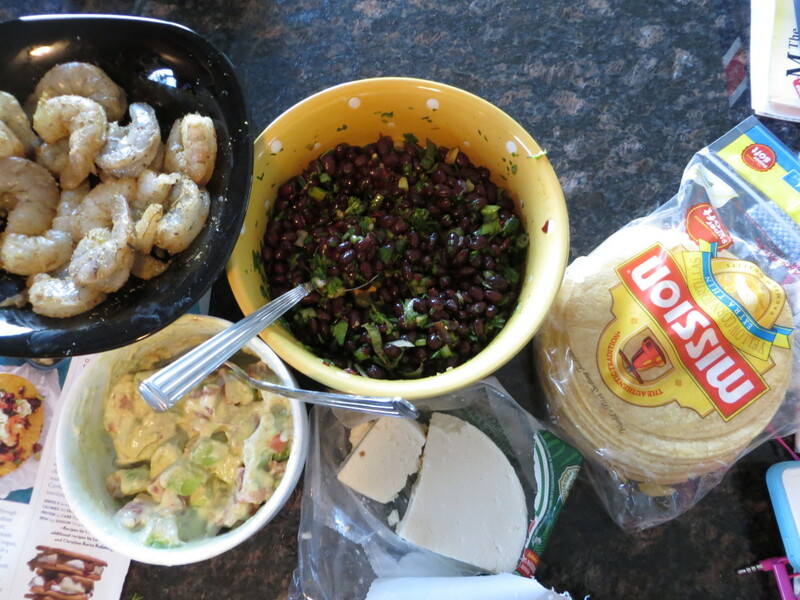 There are about 6-8 shrimp tostada recipes so I learned from those clippings to produce this one. 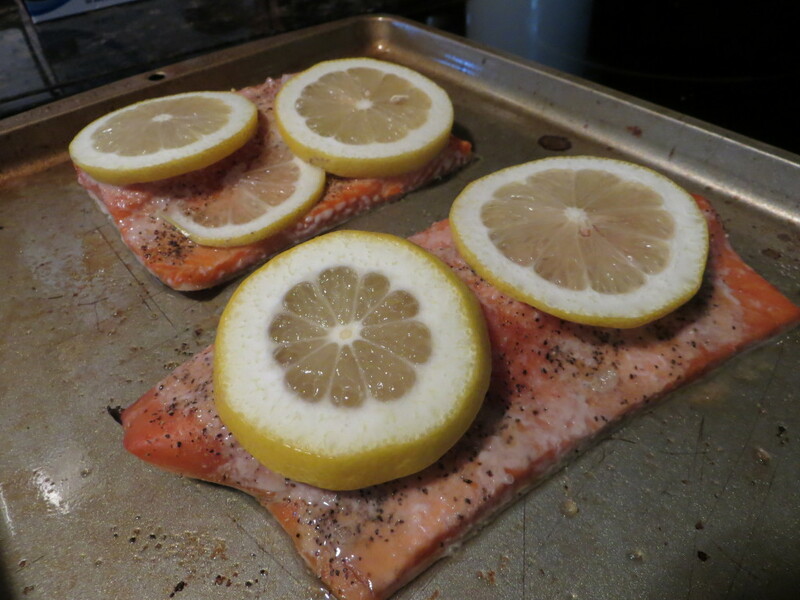 The main recipe is based off of a Cooking Light original. No time for dinner? No problem. This is yet another Dinner In Twenty recipe. It actually can be prepared in less time than that if you make your toppings ahead of time too. If you saw my post on Paige’s blog last week, you read that I like to try to incorporate Mexican into my weekly dinner routine. 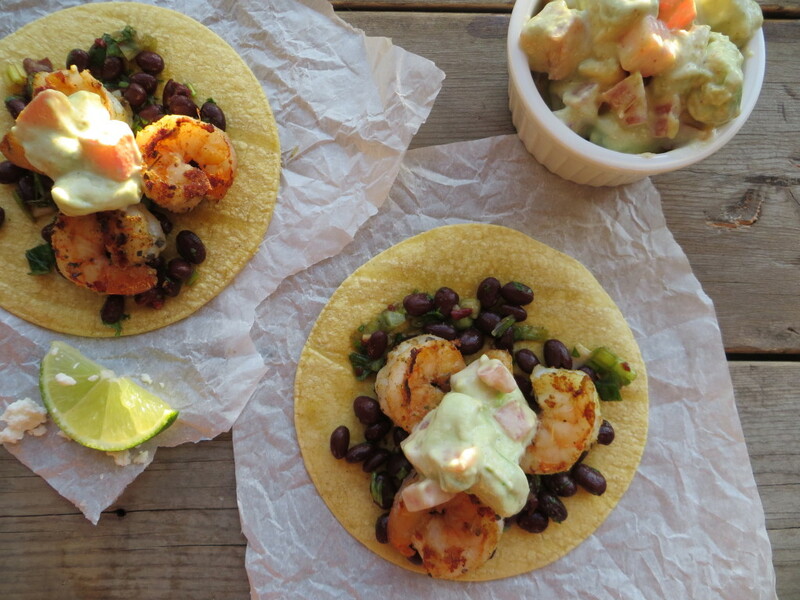 We love the spicy, bold flavors of Mexican cuisine and they typically are quick to prepare. One of my favorite components of this recipe is the Spicy Black Bean Salsa I posted on A Dose of Paige. You will have to visit her website to get that portion, trust me it’s definitely not one you want to leave out! The link is below. 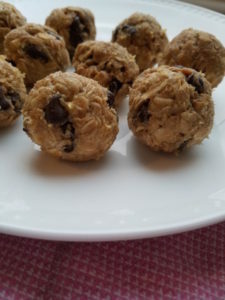 I hope you enjoy this yummy and Not So Doughie recipe! 1. On a baking sheet, toss the shrimp with the cumin, oregano, cayenne, salt and pepper. Spread evenly and bake at 350 degrees for 4-5 minutes or until pink. 2. 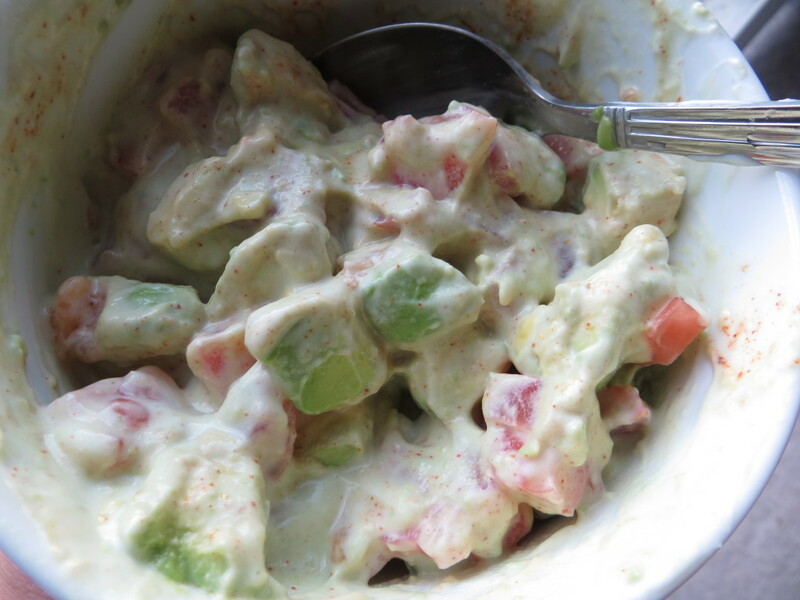 In a bowl, combine the avocado, tomato, Greek yogurt, and lime juice. Season with salt, pepper and chipotle seasoning. 3. 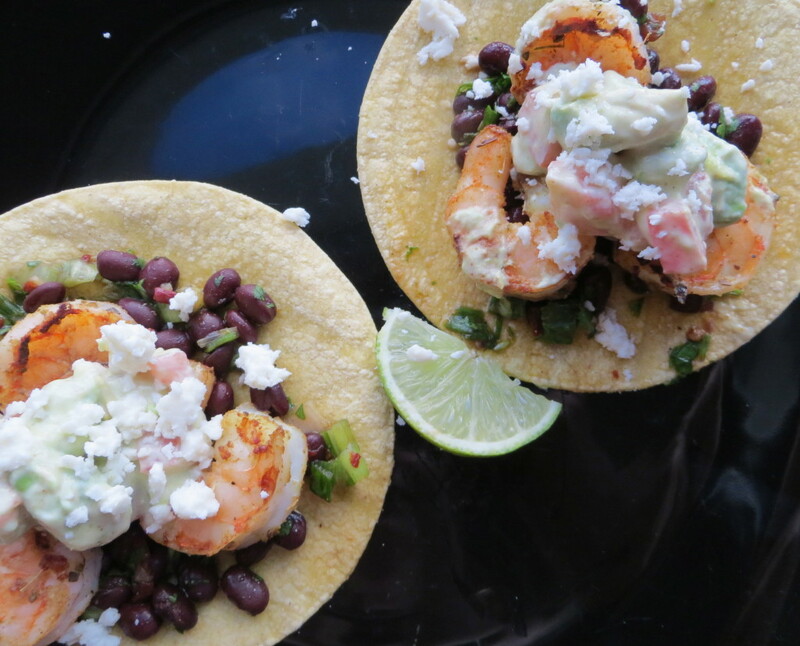 Lay out your corn tortilla and layer with the bean salsa, shrimp, avocado spread, cheese and chopped cilantro. 4. Serve with a dash of hot sauce if preferred. Happy Monday! Today marks the 2nd month of my recipe contribution to A Dose of Paige. 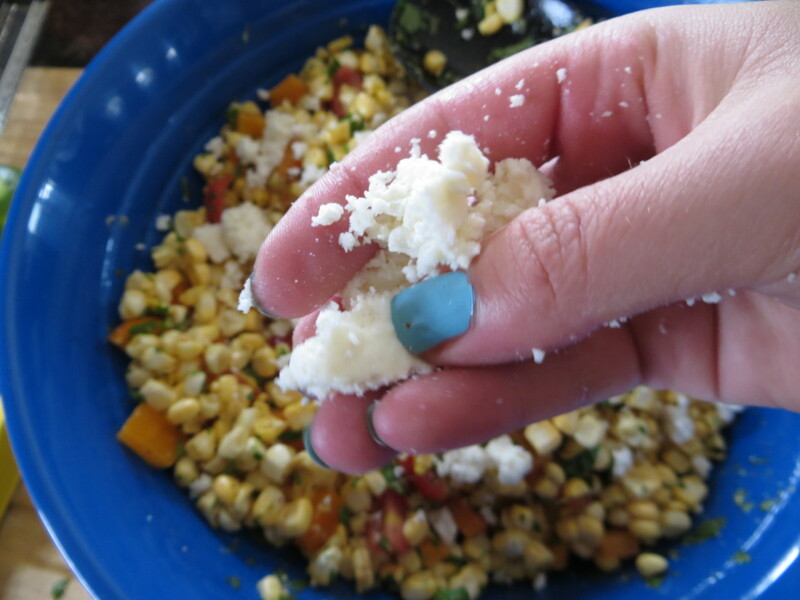 On her blog, I share a delicious, unique twist on homemade salsa. I created a duo that complements each other perfectly. 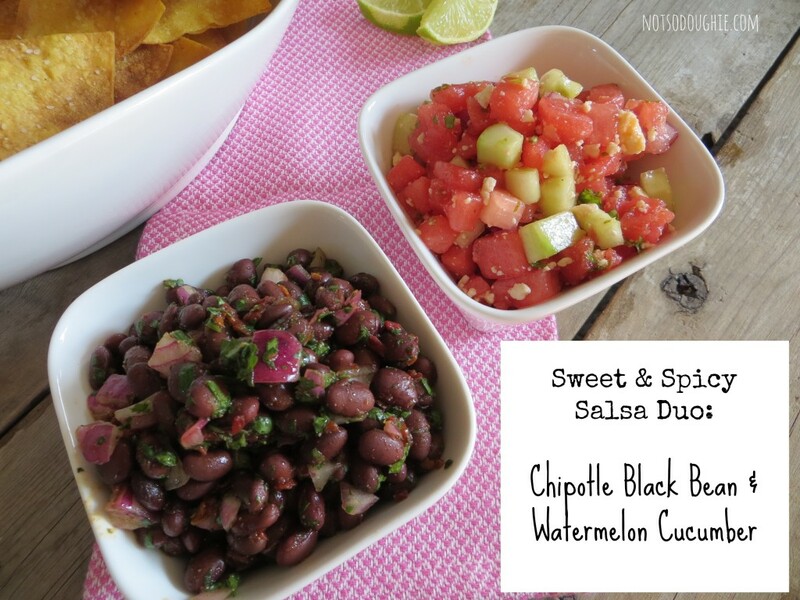 Sweet & Spicy – A Chipotle Black Bean & Sweet Watermelon Cucumber. I also made my own homemade corn tortilla chips. 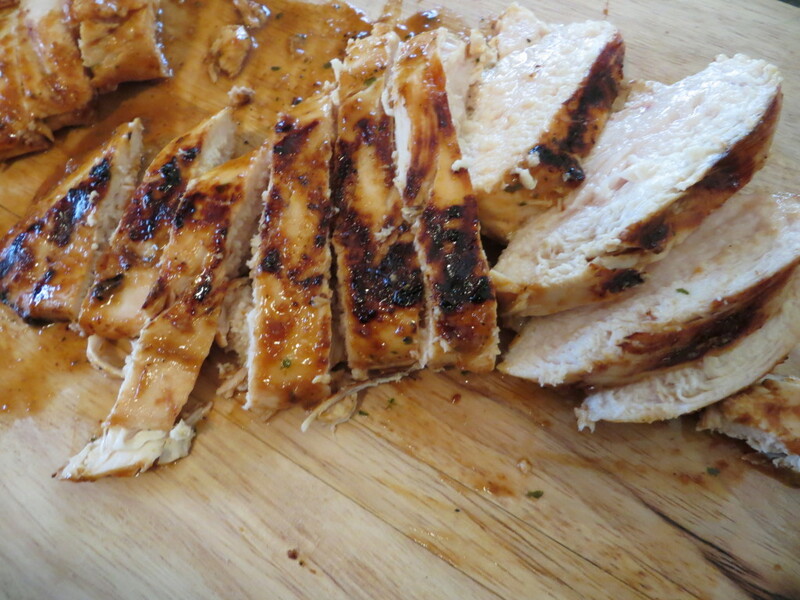 You’ll have to visit her site to see more pictures and get the recipe! Click on the link below. Who doesn’t love a sweet, juicy peach during the summer? Seriously, if you don’t like peaches I am curious as to why not? I get pretty excited the first time I see the stocked peaches at the grocery store. Chase loves peaches, he would eat 10 in one sitting if we let him. They are frequent visitors on our dinner plates (and breakfast and snacks for me) during the summer. A fresh cut up peach stirred into some yogurt with a bit of granola – such a yummy (and healthy!) breakfast. For a medium peach, there is about 60 calories. These delicious gems contain a dose of vitamin c, potassium and vitamin A. If you need a bit more fiber in your diet, grab a peach! Nutrients in peaches aid in inflammation and help lower your cholesterol. Careful however, because they do contain sugar, but it nature’s sugar so no added crap here. The peach is actually from the rose family, originating from China. China & Italy are the top peach growers. Be careful not to eat that pit though! They are poisonous, but if you dry it out on the counter then put it in the fridge for a bit, plant it and you could maybe have yourself a little peach tree! You will have to move south to keep it growing and if you are lucky it may sprout. So there’s a bit of peach info for you, now onto the recipe! I love incorporating peaches into different recipes, their unique flavor is subtle, yet noticeable. In addition, they add the perfect amount of sweetness to a recipe. 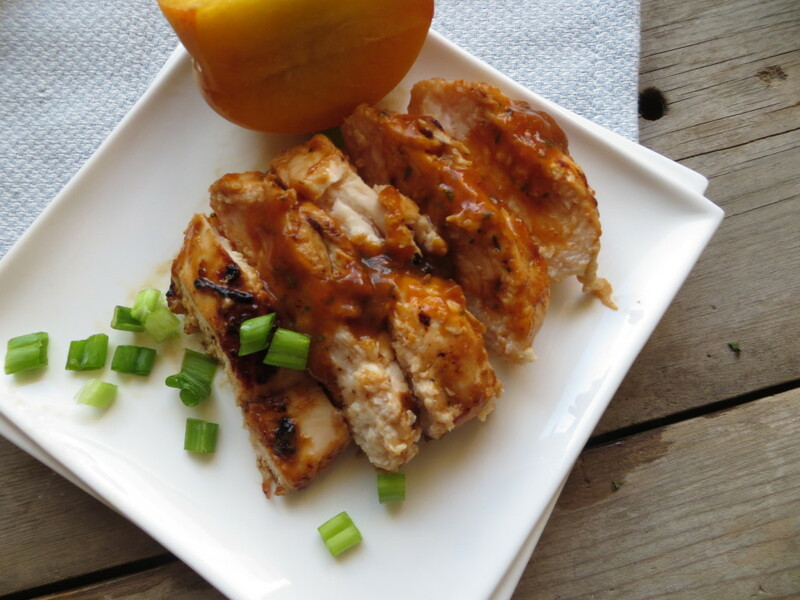 Two summers ago, Chase and I grilled some chicken and topped it with a peach salsa of sorts. We left it raw and it was a refreshing touch to the smokey chicken. This time around, I wanted to combine it with the smokey and spiciness of chipotle peppers. If you aren’t a big spicy food fan, this isn’t quite your recipe, but there’s an easy switch! Just eliminate the chipotle pepper 🙂 The peaches are cooked on the stove until melted, their natural sugars completely exposed. A quick pulse in a food processor and this meal’s star is ready. Definitely another Dinner in 20! I hope you enjoy my perfect summer BBQ recipe! 1. Generously season the chicken with salt and pepper. 2. In a small pot, add the garlic and shallots. Cook for about 2 minutes. 3. 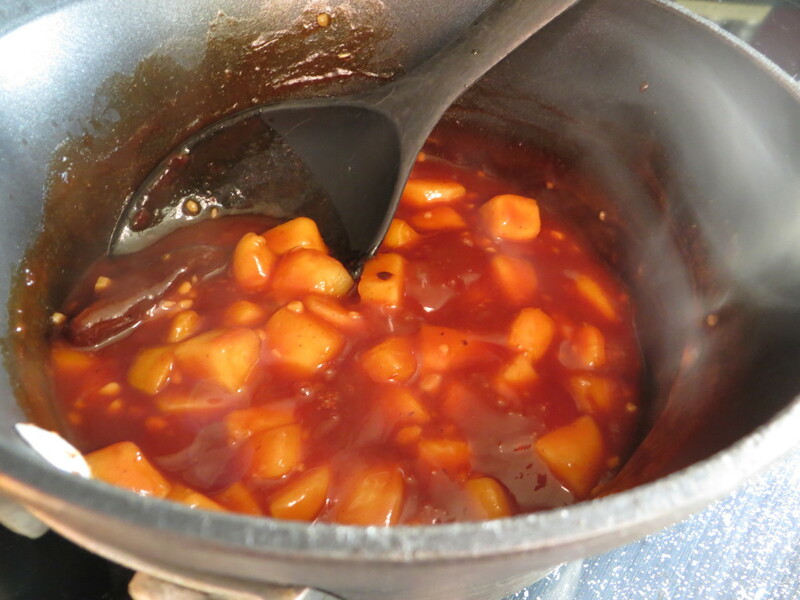 Add the peaches, ketchup, BBQ sauce, lemon juice, and chipotle peppers + adobo. Bring to a boil. Reduce heat. 4. Simmer for about 10 minutes or until the peaches have completely softened. 5. 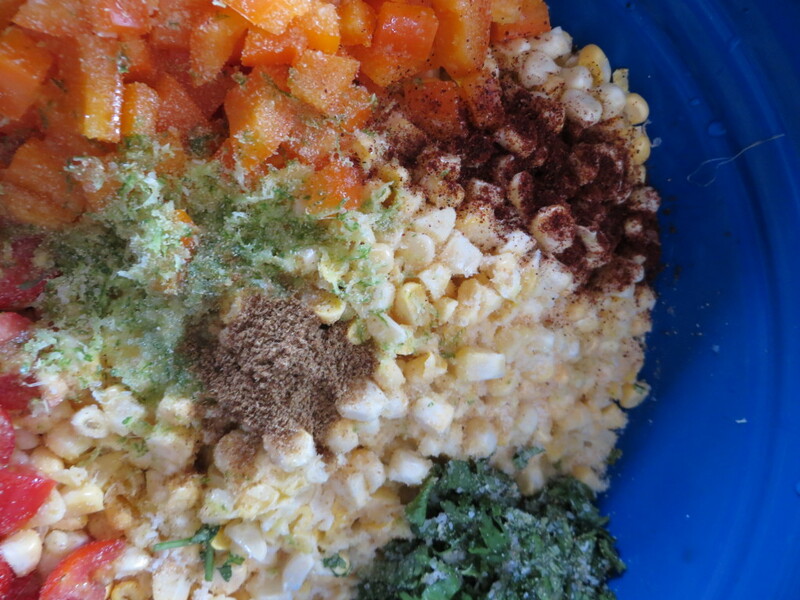 Remove from heat and pour contents into a food processor. Add the cilantro. 6. Pulse until completely smooth. Season with salt and pepper. 7. 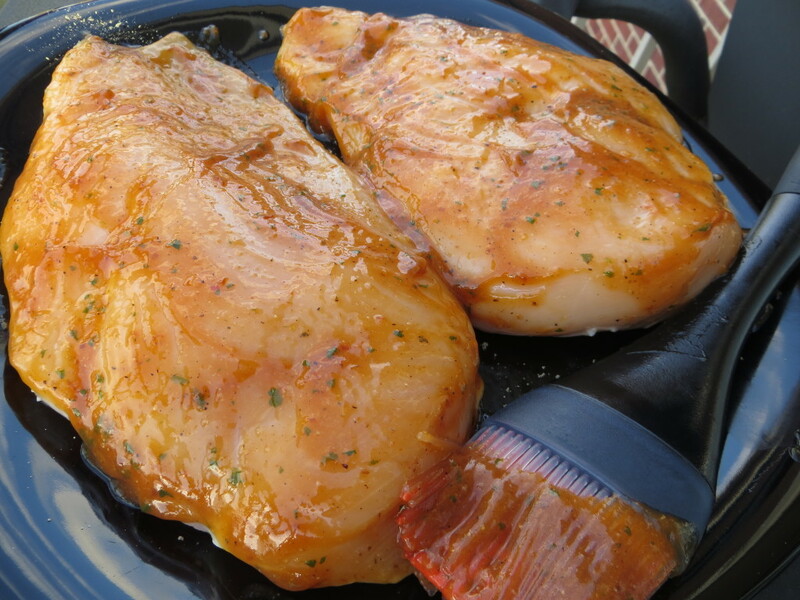 Using a brush to paint the BBQ sauce onto the chicken breasts. 8. Heat a grill over medium-high heat. Place the chicken on the grill, not directly over the heat. 9. Cook on each side about 5-8 minutes, depending on thickness. 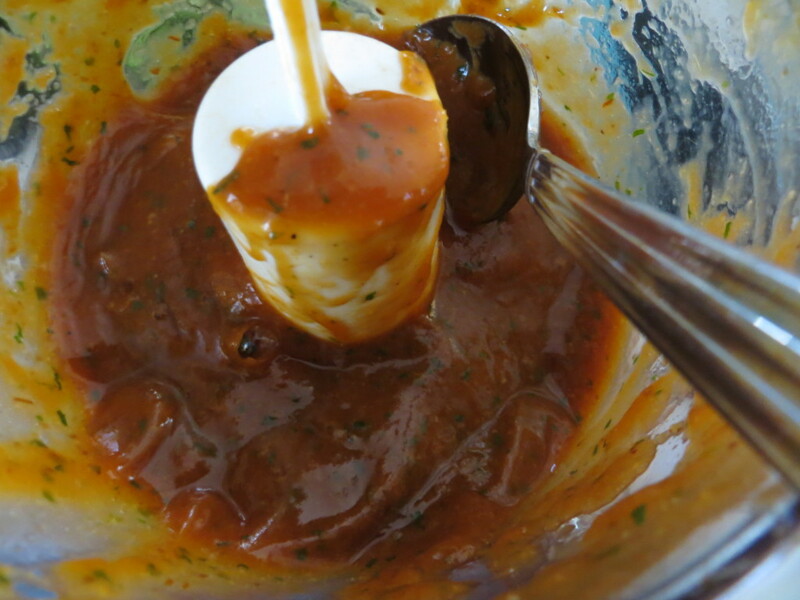 Paint a bit more BBQ sauce on each time you flip the chicken. 10. 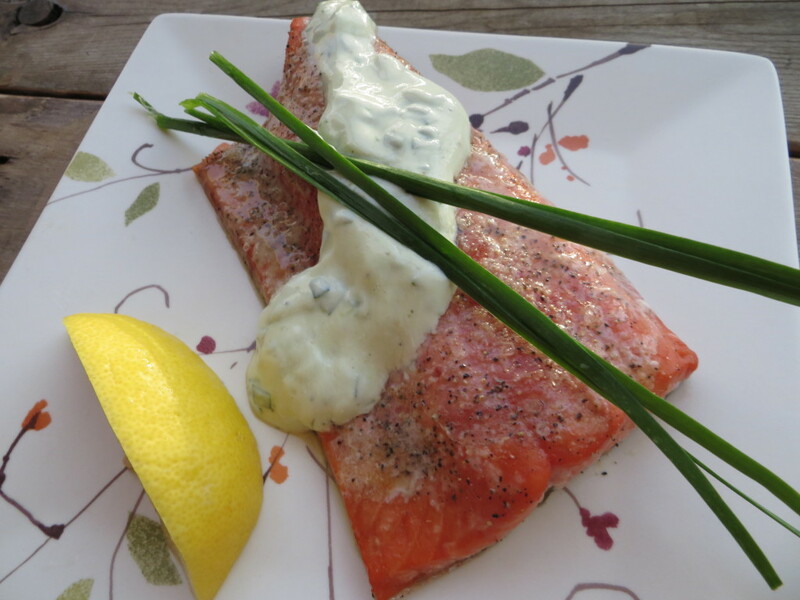 Cut into slices and serve with additional sauce.